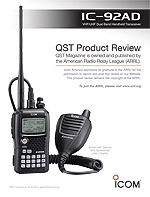 Read the QST Review of the IC-92AD here! The IC-92AD and HM-175GPS have superior waterproof protection and is equivalent to IPX7 (1m depth of underwater for 30 minutes). The aluminum diecast chassis and gasketsealed housing provide performance you can count on in harsh outdoor environments; when hiking, mountain biking, touring and for alpine activities. Used with the GPS speaker-microphone, HM-175GPS, the IC-92AD shows your position data on the display and offers automatic position reporting in DV mode. 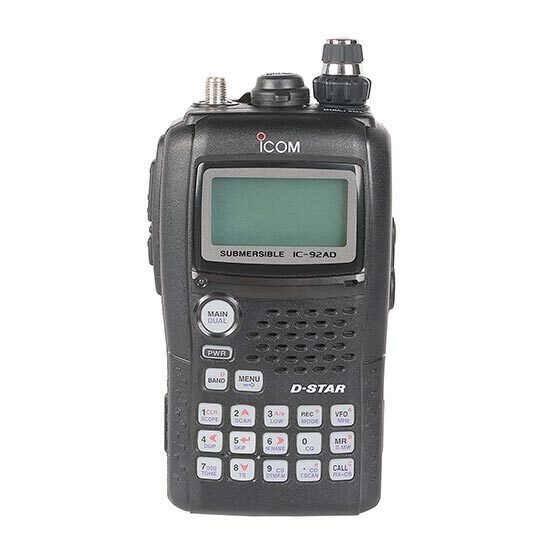 The IC-92AD shows the direction to a received D-STAR station or to a memory stored with a compass-like display pointer. In addition, the GPS-A mode assists in easy D-PRS system operation. The IC-92AD has dualwatch receiver capability, allowing you to receive* on two bands simultaneously (including the same band). By pushing and holding the [Main/Dual] button, you can easily turn dualwatch on and off, while a single press toggles the active VFO channels (A band/B band). * See specifications for receive range coverage. 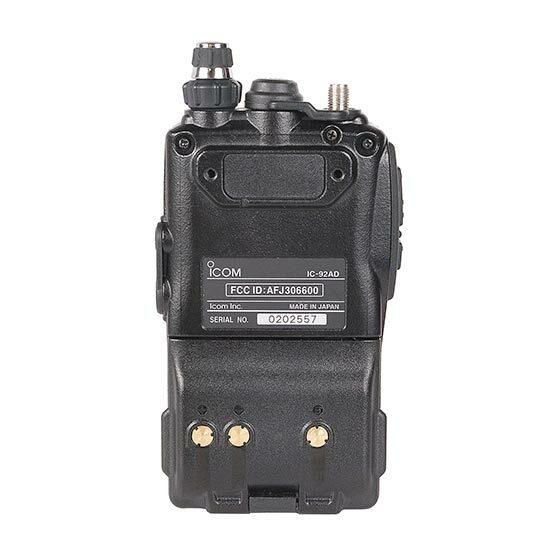 Icom's original wideband PA circuit and supplied lithium-ion battery pack provides 5W (typ.) output power on both VHF and UHF bands. The supplied BP-256 provides up to 6/5.5 hours* of operating time. When you don't need full power operation, you can reduce output power to 2.5/0.5/0.1W (typ.) to reduce battery consumption. VHF 6 hrs. 8.5 hrs. 14.5 hrs. 19 hrs. UHF 5.5 hrs. 7.5 hrs. 14.5 hrs. 19 hrs. Simple bandscope spectrum activity is displayed on the screen and audio is heard while sweeping. The bandscope is useful for finding new or interfering signals. 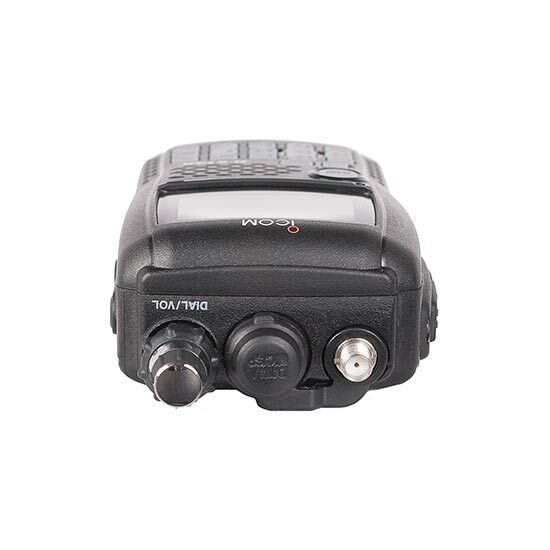 The built-in voice recorder* records an incoming call for up to 30-seconds (approx. ), (or 15 sec. × 2 tracks, 10 sec. × 3 tracks). For automated outgoing calls, you can pre-record up to 10 seconds of your callsign and/or CQ message in the IC-92ADs voice memory. Using a large full dot-matrix display (37.8×20 mm; 11⁄2×25⁄32 in), the IC-92AD clearly shows two-line frequency settings, alphanumeric channel name, bandscope, received message and position information, etc. You can change the display setting to show frequency or memory name in the center of the display. In addition, automatic LCD and keypad backlighting provides bright illumination for night time operation. The one-touch reply [CALL RX->CS] button memorizes the received callsign(s) with a single touch. 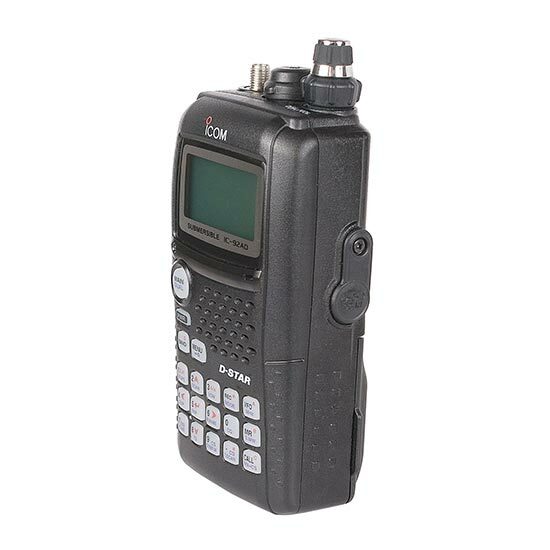 This function allows you to respond to the calling station without hassle. In addition, up to 20 received callsigns are stored in a received call history. The four cursor direction buttons on the keypad give you quick and intuitive access to many settings. The dual volume/channel knob provides convenient channel selection and volume control. When connected to a PC via RS-232C, most functions of the IC-92AD can be controlled from the PC with the optional RS-92 software. In DV mode operation, you can send and receive short messages of 20 characters (max.) on the PC.